This is a chart from the American Lung Assn. website. The Tax Foundation has a new Monday Map on Tobacco Revenue and ranks each state by the percentage of state and local taxes raised by tobacco taxes. This is different from the usual cig-tax chart showing taxes as a dollar amount per pack of 20 or as a share of purchase price. New York City ranks high on such charts. Today's Tax Foundation chart may be found here: http://taxfoundation.org/blog/monday-map-tobacco-tax-revenue-percentage-total-state-local-tax-revenue. The light-colored low-tobacco-tax states like South Carolina (surprise! ), with 0.2 percent of its revenues from tobacco taxes, are the ones with low taxes. The highest-taxed tobacco is in New Hampshire, ranked #50 (puzzle: if DC is included with a rank as a state, how do they only come up with 50 states? ), with 4.4 percent of their revenue coming from tobacco. This state is all in black. The second-last state, Delaware, is only shown with a dark shade. 1. Consistency. One reason tobacco taxes bulk higher in New Hampshire than in other states is that NH has low overall taxes. If overall taxes are low, then New Hampshire's percentage of revenue from tobacco will be higher than another state where tobacco is taxed at the same rate relative to a carton of cigarettes. NH is being penalized for what the Tax Foundation espouses - a low-tax environment. 2. Pigou Tax. Economists disagree about lots, but no one I know doesn't like (in theory) Pigou taxes. Pigou argued for taxing "bads" rather than "goods". Don't tax labor, he said, but tax bad things, negative externalities such as pollution, smoking, city congestion. That way, we reduce the production of these bad things and create revenues for their remediation. New York City has high cig taxes, not to mention smoking bans (which are like super-high taxes), and smoking has dropped. Now if you like Pigou taxes, you would reverse the ranking and the shading. New Hampshire becomes #1 and has the lightest color. South Carolina has the darkest color and is ranked (I suggest) #51. 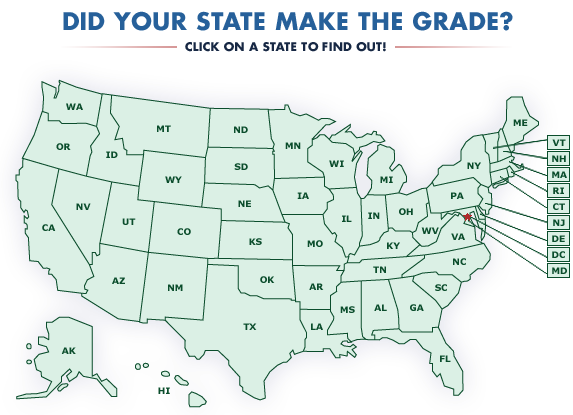 Something like that may be found here: http://www.stateoftobaccocontrol.org/state-grades/.